Salads feed a lot of people on a budget, and Waldorf salad is always a treat. The combination of apples, celery, and walnuts is delicious. This recipe works well with many common Thanksgiving and Christmas entrees. 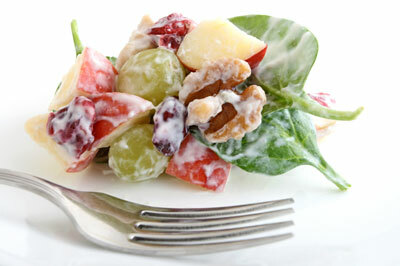 Waldorf salad was created at New York’s Waldorf-Astoria Hotel in 1896. However, a chef wasn’t responsible, as you may think. In fact, the maître d’hôtel, Oscar Tschirky, invented this popular salad. The original version contained only apples, celery, and mayonnaise. Chopped walnuts later became an integral part of the dish. In a small bowl, combine the mayonnaise, sugar, lemon juice, and salt. Mix until smooth. In a large bowl, combine the apples and celery. Pour the mayonnaise mixture over the apples and celery and toss until coated. Cover and chill for 30 minutes. Just before serving, toss in the walnuts.